Ghosn wants Korea's Renault Samsung Motors to export more Renault and Nissan cars. Renault is counting its strategic partnership with Daimler to help overcome its chronic troubles selling high-end cars. Renault CEO Carlos Ghosn said the French automaker would collaborate with Daimler subsidiary Mercedes-Benz on a new high-end model. He made the comments during a radio interview with France Inter last week. At the Frankfurt auto show last September, Ghosn said that Renault was considering using Mercedes modules for a future high-end model. The CEO declined to reveal which Mercedes modules it would use, but the companies already have agreements in place to share platforms and powertrains. A Renault spokeswoman also declined to offer more details about the modules Renault would use. Renault and alliance partner Nissan formed their partnership with Daimler in 2010. Renault plans to launch replacements for its Espace, Laguna, and Vel Satis high-end models beginning in 2014. A Renault source told Automotive News Europe that the Espace's successor would be the first of the three to debut. 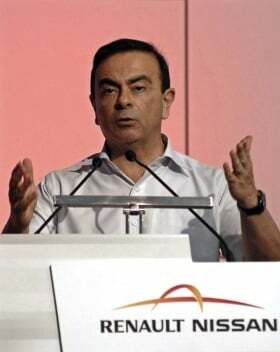 During the radio interview, Ghosn acknowledged Renault's difficulties in the high-end market. He said the company would apply what it learned from its "past mistakes." The Latitude is Renault's current flagship model. It has served as a temporary replacement for the Vel Satis, which Renault launched in 2001 but discontinued in 2009 due to disappointing sales. Sales of the Latitude, which Renault subsidiary Samsung Motors produces in Korea, totaled 10,719 units in 2011, ranking it third after the Skoda Superb and Subaru Legacy/Outback in Europe's large-car segment, according to market researcher JATO Dynamics. Collaborating with Mercedes could help Renault offer a premium model that it could sell at a profit, said Carlos Da Silva, an analyst for IHS Automotive. Otherwise, Renault would likely not be able to afford the investment required to deliver a model for upper-end car customers, which the Vel Satis failed to attract, Da Silva said. "Renault faces quite a dilemma: investing in something that will meet the demand but that will never be profitable in the near term given the sales volumes or just upgrading what they already have on the shelf, while perfectly knowing that they will not exactly meet the demand," Da Silva said. "Hence, the big advantage for Renault of partnering with Mercedes … they are basically getting access to a larger shelf." As part of Renault-Nissan's partnership with Daimler, Renault will produce a four-seat model for Daimler subsidiary Smart in Novo Mesto, Slovenia. The new Smart will share a platform with the next-generation Renault Twingo minicar. Both models are scheduled to launch in 2013. In addition, Daimler and Nissan will build Mercedes four-cylinder gasoline engines for Mercedes and Nissan's luxury brand, Infiniti, in the United States starting in 2014. The partners also plan to co-develop powertrains in the future.